One last sad lunch at Food for Thought, it closes on Sunday after forty years in business, driven out of business by a greedy grasping landlord driving up the rent to an unaffordable level. I usually enjoy my food at Thought for Thought. But not today. 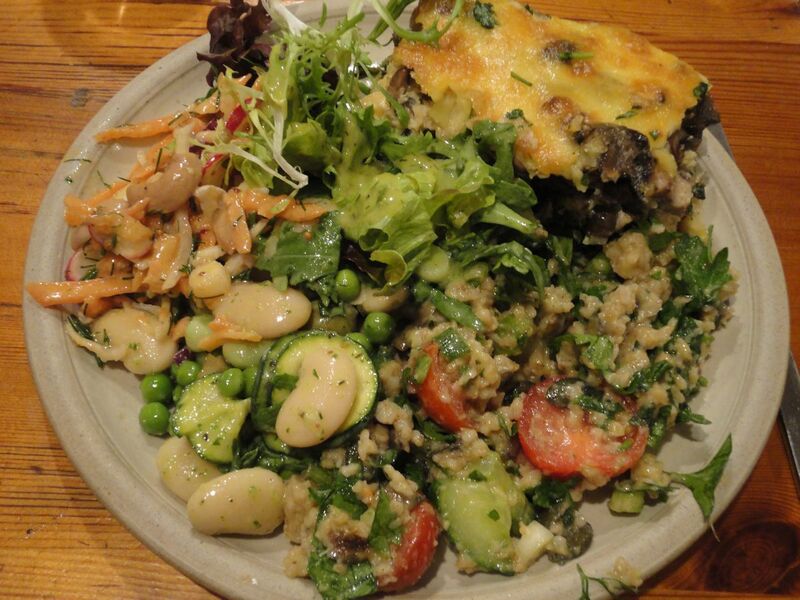 I think partly my choice, I chose quiche and salad, a mistake, I should have had the soup, followed by stir-fried vegetables and rice. But I think also that it was my last meal, that it was closing. I would have liked to have bought their cookbook, but they had none, try later in the week. Food for Thought has been there since the 1970s, the food has been consistently good. When Covent Garden market pulled out, the area was desolate, it was earmarked for redevelopemnt. Activists stopped the redevelopment. But what we have seen is a slow death. he samlll businesses that made it what it was , leaving, to be replaced by chains. In the 1970s, there were many small businesses like Food For Thought. Next door, was a barrow maker. In the street the barrows. In thes ummer, we used to get our food, take it outside an sit on the barrows. In Neal’s Yard Neal Yard Wholefood, Neal’s Yard Bakery, Neal’s Yard Dairy. All long gone. In one of the side streets, Pret a Manger, Costa, in Neal Street sweatshop fashion chains. Small businesses are being destroyed by property companies. Social cleansing is taking place, people kicked out of their homes, bulldozed, luxury apartments built, marketed in the Middle East, China and Russia. There are now several empty premises in Neal Street, including one next to Food for Thought. Will the vacated Food for Thought join the list? The greedy property company will not care, one more business destroyed. If it sits empty they will offset the losses against tax. We need political action to stop the destruct of the social fabric of our cities. We have to have rent control as in New York. We have to have protection for small businesses as they have in France. I set off later than I would have wished, maybe a couple of hours later. I missed a bus, next bus failed to turn up, as a result I missed the fast train. Long queue at ticket office, missed the next train. When the queue goes down, they open a second window. Typical piss-poor service from South West Trains. Two trains missed, was it worth going? On the street outside Waterloo Station, a hydrogen powered bus. Around the South Bank, the streets appear pedestrianised, but actually they are not. Why not? A helical slide, two helical slides, running from the top of the Heywood gallery. I have never noticed before. 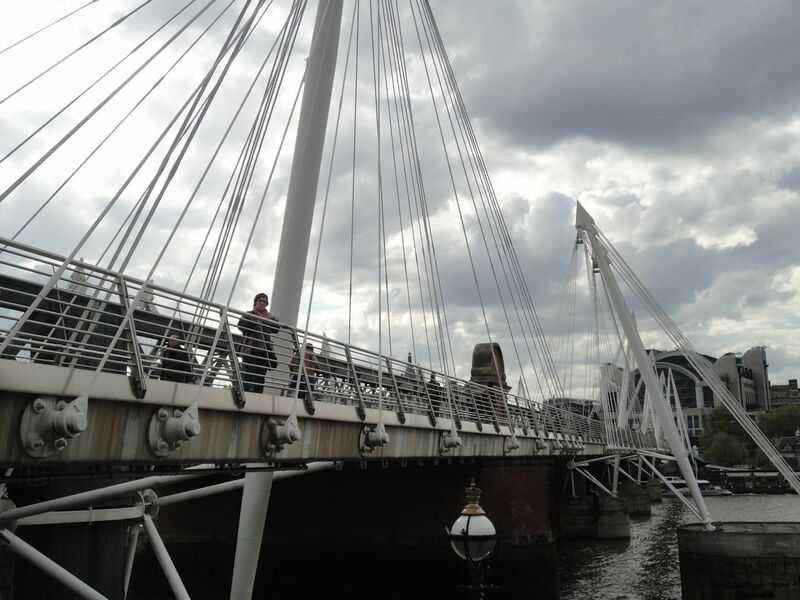 Pleasant walk across Hungerford Bridge, view down the Thames. 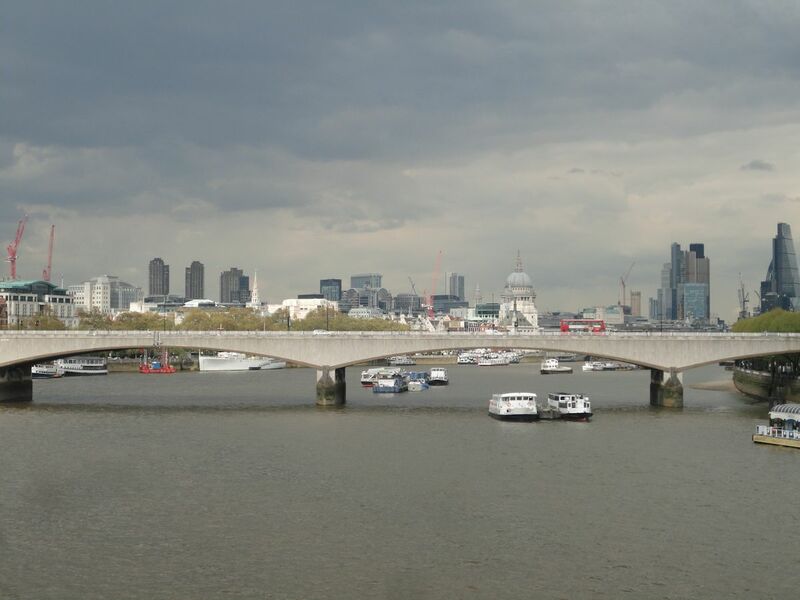 Joanna Lumley wishes to spoil this view by building a bridge. No one knows why, and the stupid idea has zero support. This is the same Joanna Lumley who flooded Aldershot with filthy Nepalese. In Embankment Gardens, banana trees have been planted in the middle of flower beds. Walk up through Covent Garden and into Neal Street. It is depressing how Neal Street has been destroyed. Sweatshop fashion chains, down a side street Pret a Manger and Costa. One last meal at Food for Thought. It closes on Sunday. Driven out of business after forty years by a greedy, grasping landlord. I wanted a 243 bus, but could only find a 242. It went in the right direction. Waiting at the bus stop, I was reminded of Neuromancer by William Gibson, a damaged dysfunctional society. Girl at bus stop, one view normal, other side a quarter shaven head. The bus passed through the City of London. Joseph Campbell said we judge who is important in society by the size of the buildings. In mediaeval society it was cathedrals and palaces. Passing through the City of London, banks and other parasites on society. I alighted at Kingland Road. I guessed correct, only a little way down the road a sign pointed to Hoxton Market. I followed where it pointed, but then no more signs. I guessed which way, and I was correct. 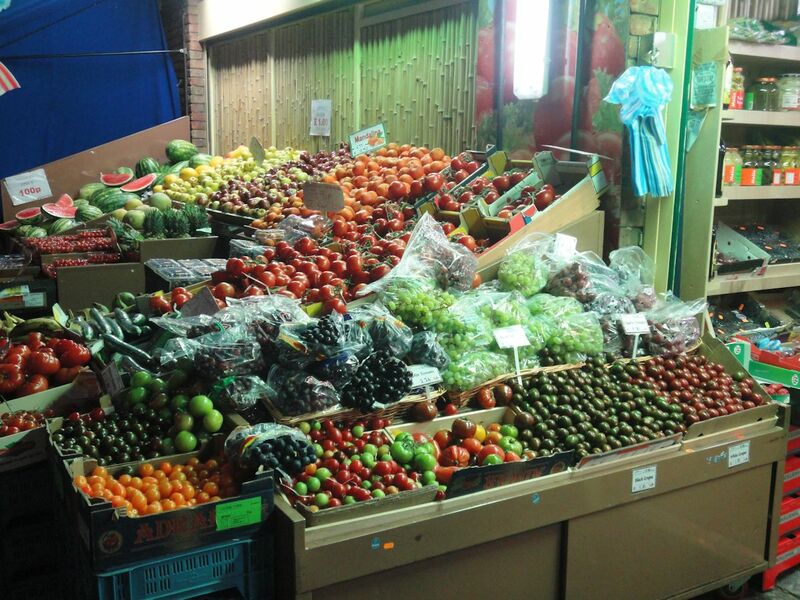 Wonderful fruit and vegetable shop in Hoxton Market. Filming outside a halal butcher. They objected to me walking by and asked that I moved on. I pointed out I was on public highway. 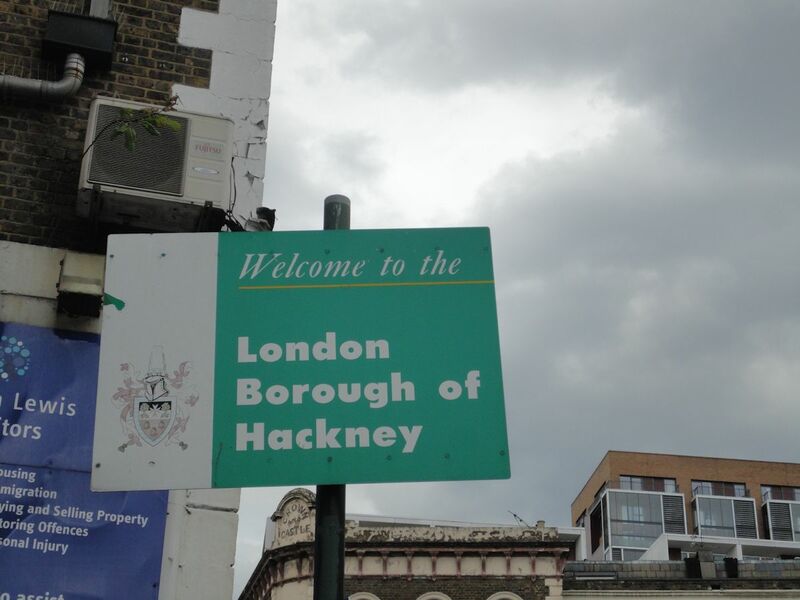 I should have asked to see permission from Hackney Council to film. And raised animal cruelty halal butchers. I popped in Hoxton News with the Trews canopy. The man serving knew nothing. But he did say he was new that day. I should have suggested they had an A-board outside listing latest Trews, with a code to scan. What I was looking for was the Trew Era Cafe. I finally found it, the shutters were down, it was closed. I walked in. Sorry we are closed. The second time, I arrive to find it closed. The first time it took me two hours to find. This time one and a half hours, therefore an improvement. It now closing at six, not seven. Makes sense in the winter, but not in the summer. I was promised a free coffee if I visit again. On display Trews t-shirts. The ethical ones, I was told. Strange different sizes from different factories. Big scandal, expose in Daily Mail, sweatshirts from sweatshops. Russell Brand had placed orders in good faith, part of smear campaign by Daily Mail, if they cared about sweatshops and exploited workers in Bangladesh, they would be exposing the global fashion brands, factory gate price a dollar, retail $70. I felt one of the t-shirts, very soft, probably organic cotton. In the coffee bar £30. Where therefore had Daily Mail got the figure of £60 from? No one was able to answer my questions on the clothing. Fair enough, they are there to make the coffee. But, Russell Brand needs to be more transparent, on sale in the coffee bar, make sure the staff are briefed, can give an account, where made, working conditions, why the huge mark up between factory gate price and retail. No copies of Revolution on sale, or at least not on display. Trew Era Cafe has been financed from sale of Revolution. On a shelf, a beautiful carved chessboard with invalid squares. Integral to the board and beneath a cabinet with a drawer contain the chess pieces. I walked down the road with one of the staff, had an interesting conversation, and parted company at the Regent’s Canal. I suggested for The Trews, Michel Bawens to talk about open coops, open commons, sharing. As Trew Era Cafe is a social enterprise, I am surprise it is not an open coop. It is not even a coop. As it was a pleasant evening, I decided to take a walk along the canal. I was going to walk to Regent’s Park, or at least head in that direction, but decided first to walk the opposite way, which I learnt from a boat, led to Victoria Park. The boat offered me a lift, said hop on board, but I thought best to walk, as I would know when to turn around. The boat was big. I am used to narrow boats. This was twice as wide. The girl piloting the boat very skilled. It passed through a bridge, with only a couple of inches to spare. That was close, I said. She replied it was as close the other side. She demonstrated the same skill when she brought the boat in to moor. She managed all this whilst at the same time carry a small child in a sling. I went past Acton Lock, and a little further. I saw a sign, which said Victoria Park was as far again as I had already walked. I decided to go no further, or only a little way. I climbed out at Cambridge Heath Road. I saw if I hopped on a bus, I could go to Mare Street, where I know an excellent restaurant serving burgers. But was not sure where, and I did not wish to walk back along the canal in the dark. Though I did see I could catch a bus which would take me direct to Waterloo Station. I walked back and climbed out at the next road. On the way I had passed a boat with music. People hanging around the boat. I was asked did I wish my photo taken with the guy whose picture was on display. I said no. Did I wish my picture taken? No. A stunning blonde leapt off the boat, introduced herself as Emily, invited me on board, told me how well equipped the boat was, would I care to look. I declined her offer. The cyclists and joggers on the canal are a bloody nuisance. When I turned around to walk back, it was even worse, hordes of joggers in large groups. Next road I climbed out again. Not a lot here. A fish n chip shop, Broadway fish bar, with seating outside. I asked for haddock skinned, Was told it came with the skin on. I settled for a small portion of chips. They were ok, but not great. Maybe fortunate I did not have the fish. I joined two French girls sitting outside and had an interesting conversation. They were of the view as the guy I talked with from Trew Era Cafe, iTunes and Amazon very bad for music, as can only listen to a few seconds of very lofi music. I recommended bandcamp, can listen to entire album, hifi not lofi, the artist gets a good deal too. I could have added can share, the artist gets the data. This came about partly due to a discussion on intellectual property rights. It also restricts innovation, hits creativity. I cited Sita Sings the Blues as an example, also 3D printing. We innovate, copyright stops any further innovation, then when out of copyright, further innovation. The music in Sita Sings the Blues, once very popular, now not known, because Big Record Labels own the rights, and no money to be made. The way forward, as pioneered by Michel Bauwens, open coops, open commons, sharing. I walked past Kingsland Road. Luckily I saw a sign. I was just in time for a bus to Waterloo. I think 243. 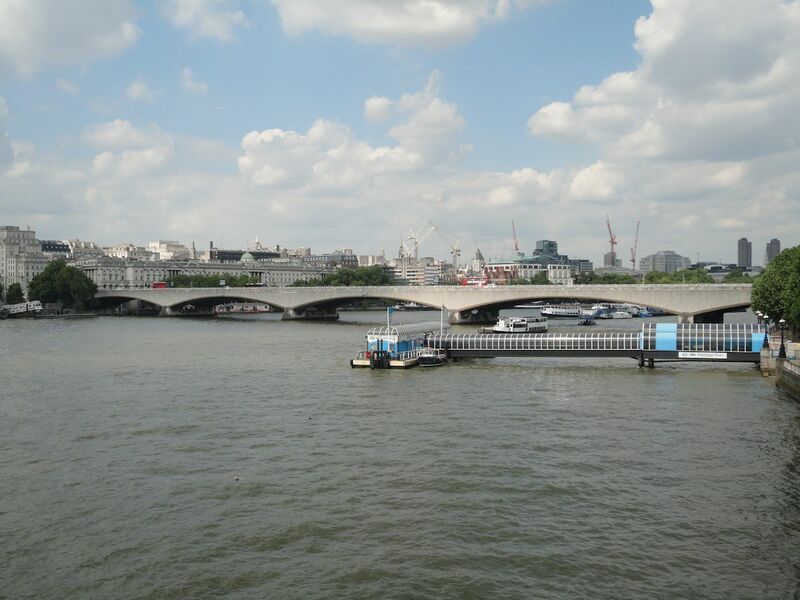 I alighted Waterloo Bridge, to enjoy the view then walked to Waterloo Station. When a book has to be hyped, it is not worth a read. When the advertising covers a huge building, then it must be crap, such is with 50 Shades of Crap. I arrived home, not long before 1am. 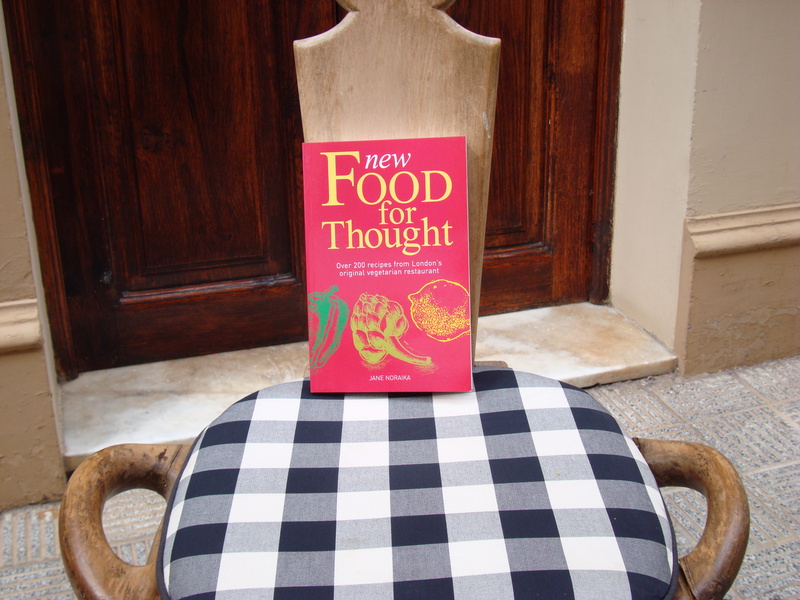 New Food for Thought is the cookbook for Food for Thought, vegetarian restaurant in Covent Garden. New Food for Thought is an old-style cookbook, no glossy pictures, no celebrity chef, instead beautiful line sketches as illustrations, and lots and lots of wonderful recipes, indeed it is packed full of recipes, and hints on how to vary, hints on how to cook, how to choose the ingredients. An exhibition of art by Meredith Owen at Food for Thought in Covent Garden, inspired by a trans-Siberian journey. The paintings could have been larger, and the artist doing himself no favours by hiding his art behind glass. Aleph, is an account by Paulo Coelho of a journey on the Trans-Siberian railway. I thought, as it was mid-afternoon, Food for Thought may be quiet. No such luck, it was packed. A group of ignorant Australians walked past everyone, bagged an empty table, then pushed in to order their food. I pointed out, order your food, then find a table. They told me they could do as they liked. The reason they have this sytem is because Food for Thought is very small. Order and pay for your food, then hope for a table. Spinach, courgette and dill soup with a salad. I added a slice of bread and butter. The spinach was overdone and made it very strong tasting. For desert scrunch together with a pot of tea. On the wall, paintings by Meredith Owen inspired by a trans-Siberian journey. The paintings could have been larger and when will artists learn not to hide behind glass. I was sat next to an artist. He agreed, put behind glass, and all you see are reflections. I picked up two copies of the book Food for Thought. 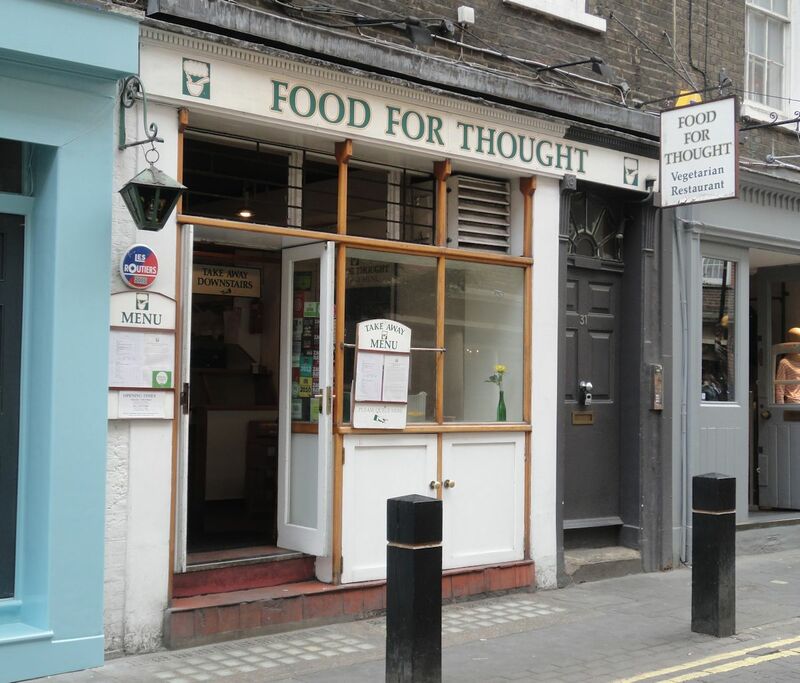 Food for Thought, a vegetarian restaurant in Neal Street, just north of Covent Garden Tube Station. The plan was Wimbledon, then Putney for a concert, but it was awful day, change of plan, Charing Cross Road, hit the bookshops (the Quest for NeverSeconds continues), eat at Food for Thought, then Putney for Il Siglo d’Oro. I had wanted stir fried vegetables with rice, but either they had run out or did not have. I settled for quiche with salad. Only you could not have quiche with one salad. It was ether no salad or four salads. A bit of flexibility is needed. I was allowed as special dispensation quiche with one salad. 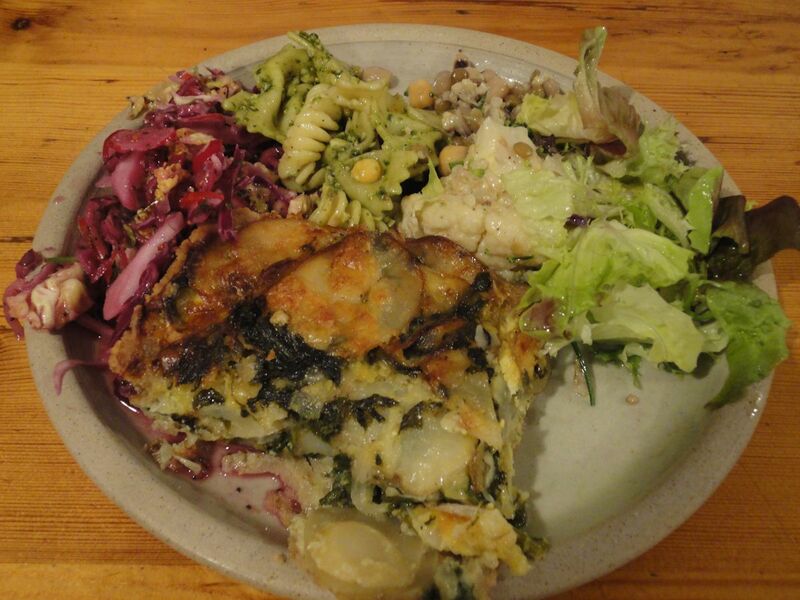 Both the quiche and salad were very good. The quiche excellent, best quiche I have ever had. For dessert strawberry, kiwi fruit, banana and blackcurrant scrunch. 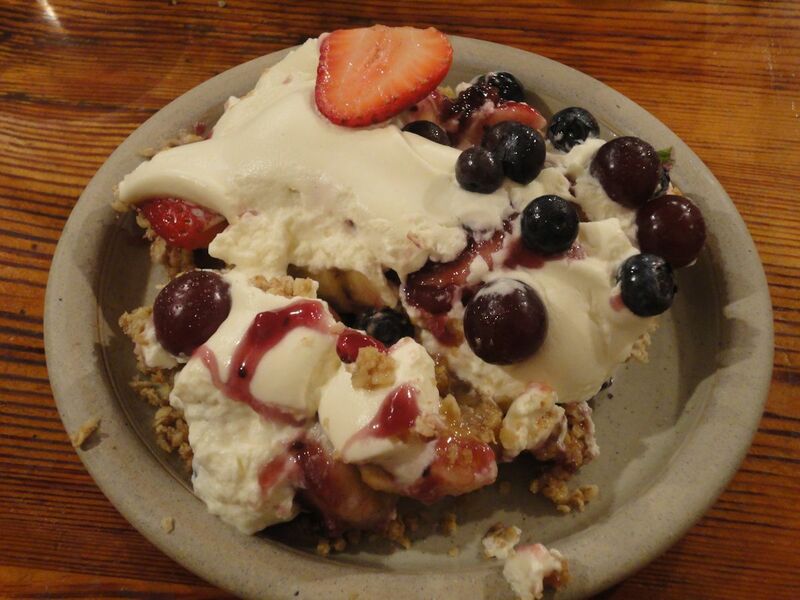 I could have had fresh fruit salad, a scone, flapjack. Plus a small pot of tea. The tea as always awful. Having had no lunch, I ate early. As I was leaving it was getting busy, a queue backing up the stairs. I am pleased to say it was better than when the week before I had lunch at Food for Thought which was something of a disappointment and not up to their usual high standard. To miss on the lunchtime crush, late lunch at Food for Thought in Covent Garden. The menu was something of a disappointment, and if this is now standard fare at Food for Thought then very depressing as this has always been a very good place to eat. Thai this, curry that, Mexican, Turkish. No, no, no. Please stick to what you are good at, not try to be all things and good at nothing. Even the soup was a curry soup. We were also overcharged as we had soup and salad and these should have been a meal deal, we were charged for individual items. The tables had not been cleared. No excuse as not busy. The desserts though were still very good. 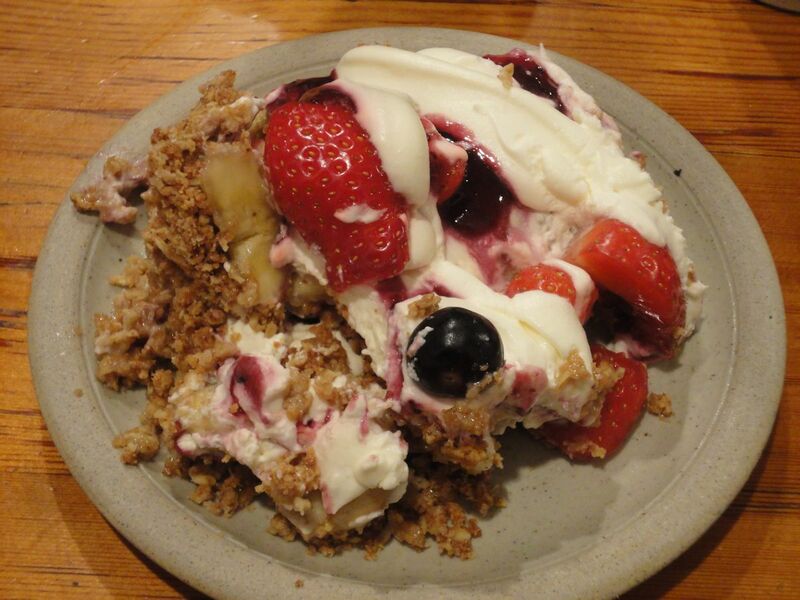 We had strawberry, blackcurrant and banana scrunch, which was delicious. I did wonder, has Food for Thought changed hands. Something has changed and not for the good. A pity as has up to now been a very very good place to eat. Synchronicity: At Food for Thought, you share the table with strangers. As we were leaving a very attractive female asked could she sit at our table. I said yes. On the table three books by Paulo Coelho. She said she had read in her own language. I asked what was her language. Turkish. We had just been talking about Turkey and Istanbul. On the board just chalked up for the evening menu: Turkish plate – Spinach, feta, sun dried tomato & olive pizza; aubergine & bulghar topped with yoghurt, mint & flaked almonds; a crunchy cabbage salad, & humous.